November 29, 2011. Sad to report that a phone conversation today with Shawn at Pine Island Marina confirms that Darwin has been cut up. February 19, 2010. Darwin is now available for free - take her away. 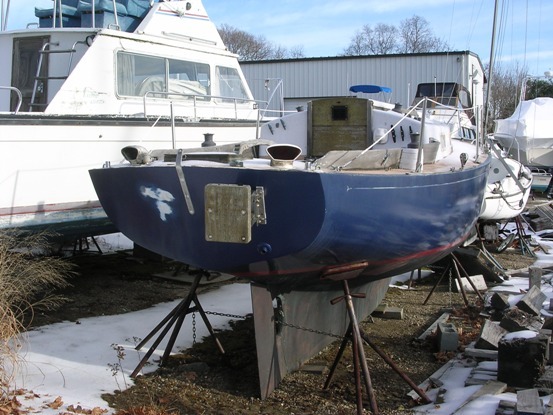 Your webmaster visited Pine Island Marina in Groton, CT and spoke with General Manager, Jeff Dziedzic who advised that, come Spring, Darwin will be cut up and disposed of. He is willing to give her away. 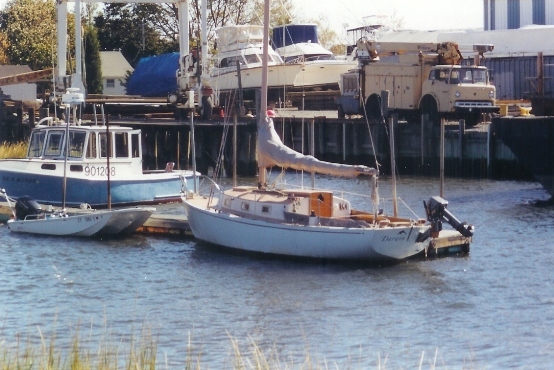 There are no sails, the boom is in the boat, and the mast is believed to be on the mast rack. 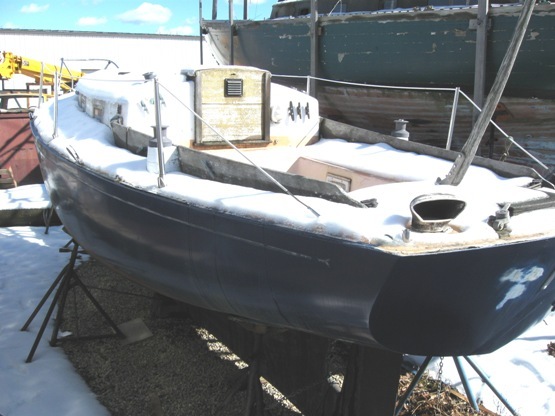 Interested parties should call Pine Island Marina 860 445 9729, or email Jeff at PIM@PineIslandMarina.com. Here is a picture taken on February 18, 2010. Darwin has an outstanding racing history under several former owners. Her other names were - Just Friends, Redheds, Sunshine, Tigress, Mei-Mei. More information about her history can be seen by going to Rosters - by Hull number and checking Hull # 20, and then the link to the individual webpage. The following picture was taken in the late 1990s by your webmaster. Your webmaster took the following photos in December, 2007. "Her rig is w/her but no sails or cushions. The hull is sound, as is the deck, but a new toerail would be a good idea as the owner previous to me removed them and glassed over and there is some separation developing. She had been left w/ main hatch open and had about 4 feet of water in her. I drained her. The main bulkhead seems ok, but some of the counter plywood has delaminated. She is a cosmetic mess! 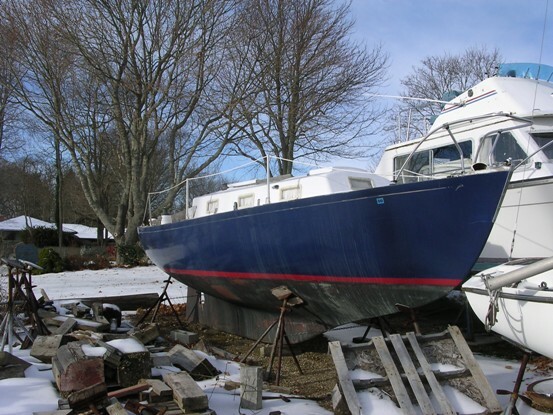 I think she is easily salvageable and mostly needs elbow grease." September 7, 2009 There has been a fair amount of interest over the past several months, but at this date Darwin was reported still for sale.